Today’s #TipTuesday I *swear* I’ve blogged about before but for the life of me, I cannot find it in my posts. So… I’m documenting it here because I ran into this again after our latest Dynamics GP upgrade and had to search for my own documentation to find the details of the fix. This tip is on how to remove the “day of the week” name from the date format on Management Reporter (MR) reports, if using the @datelong autotext code. 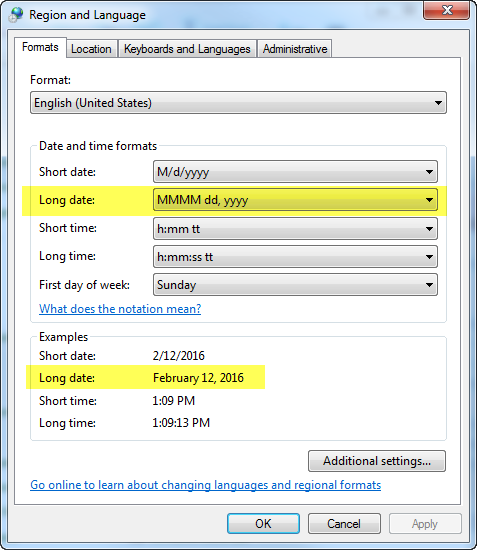 The “long date” format in MR displays the date in the format of the Long Date in your Regional Settings. When I say “your”, that’s where it becomes a little trickier as there are 2 places that need to be updated depending on which viewer you are using with MR.
Before I get into that, here’s what the Web Viewer will show, as an example, using the autotext code of @longdate on a machine with what is the typical Long Date default (DDDD MMMM dd, yyyy). It will include the day of the week. If you’re like most accountants, you don’t want to see that on your Financial Statements! Now, specifically where to change the setting will be different depending on which viewer you are using. I would guess that most clients will want to change both of these settings (local to the user’s computer settings and on the web server), because you may use a hybrid. Here at my company, we generate and use the web viewer to review things and really only use the full Report Viewer when we want to print or archive into specific folders once reports are final. This one is very specific: the regional settings must be changed on the web server where the MR process runs, while logged in as that process’ service account. That’s the part that will trip up most people. It’s not the computer itself, it’s the user’s settings on the computer and in this case, the Management Reporter Process Service account is what is getting the date format as it generates and displays the report. Here’s a brief blurb from a partner support case I initiated a couple of years ago when first running into this issue. This one is more intuitive, and for most, easier to change. When logged in as the user experiencing the issue, i.e. the MR user themselves, the regional settings on that user’s computer needs to be changed to remove the dddd from Long Date. If the user is on Citrix or Terminal Services, that is the machine where it would have to be changed, if that is where the user is launching the desktop viewer. In situations where your IT department has locked down the ability to change these settings, they may be able to change this via group policy to all relevant machines.